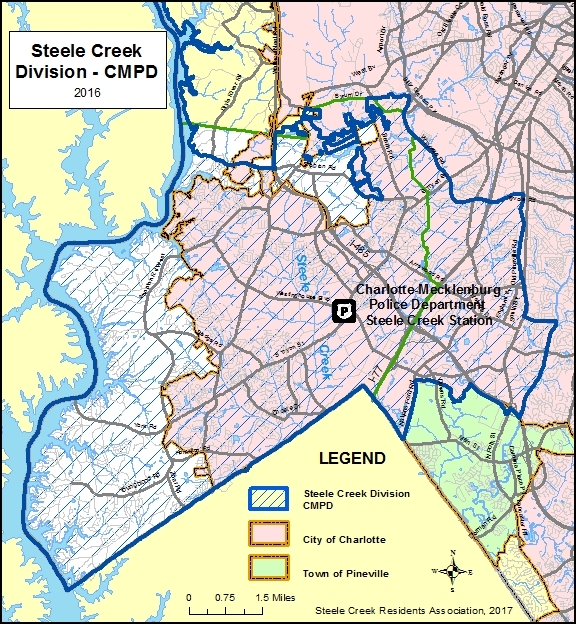 Will CMPD or the Sheriff's Office Patrol Unincorporated Steele Creek? (September 22, 2017) In April the Mecklenburg County Board of Commissioners voted to terminate the county's contract with the City of Charlotte for the city-managed Charlotte-Mecklenburg Police Department (CMPD) to provide police services to the unincorporated areas of Mecklenburg County. In the future, either CMPD will continue to provide police services to unincorporated Steele Creek under a new contract, or the Mecklenburg County Sheriff's Office (MCSO) will provide these services. county courthouse, serves civil processes, and provides fugitive functions for Mecklenburg County, in both the incorporated and unincorporated areas, but it does not provide direct police services. In order to provide police services, they would have to create a new patrol division, essentially creating a new police department under the MCSO. On the map to the right, the red area is the Charlotte extraterritorial jurisdiction (ETJ), which includes the unincorporated areas of Steele Creek. The City of Charlotte provides planning and zoning services within the red area. The unincorporated areas of Mecklenburg County (those in color on the map) comprise the Law Enforcement Service District. Property owners pay a supplemental police tax to fund police services by the Charlotte-Mecklenburg Police Department. The tax rate for the supplemental police tax is determined by a formula that uses what proportion the population of the Law Enforcement Service District is of the total CMPD service area. On the map below, the pink areas are within the City of Charlotte and receive city services. The area in white is unincorporated and currently receives police services by CMPD. The area in blue cross hatch is serviced by CMPD's Steele Creek Division, located on the corner of S Tryon Street and Westinghouse Boulevard. It includes the Lake Wylie Patrol. At the September 19 Board of County Commissioners meeting, County Manager Dena Diorio discussed a report commissioned by the MCSO that describes a plan for the MCSO to provide police services to the unincorporated areas, excluding the ETJs for Davidson, Cornelius, and Huntersville. Fill 121 new staff positions (101 sworn and 20 non-sworn). Create new support functions, including criminal investigations, juvenile investigations, crime scene investigations and laboratory, recruitment, records, property and evidence, IT support, school resources, crime prevention, alcohol law enforcement, and vice and narcotics enforcement. Provide new facilities for patrol division offices and lake enforcement. Provide training for new staff. Create or contract (with Pineville or MEDIC) for communications/911 services. Establish or contract animal control services. Acquire uniforms, vehicles, firearms, and other equipment. The estimated initial year's cost would be $21,071,400.00, including capital investment expenses of $9,592,300.00. Thereafter, the projected annual operating costs are $11,479,100.00. Work to establish the new patrol division must begin by September 30, 2017 in order to be operational by July 2018. As negotiations with the city are ongoing, it is not possible for the county to make a decision by September 30. The FY 2018 county budget includes $17,681,060 for the Law Enforcement Services District. This would be reduced if the northern part of the county were excluded. However, the costs have been increasing, and the county would need to raise taxes by 2.5% to offset the removal of the northern ETJs from the Law Enforcement Services District. Payments under the current contract are not sustainable, and the formula to determine the Law Enforcement Services District tax rate must be revised in order for the county to continue to have CMPD service the unincorporated areas. Request a one year extension of the contract with the city to July 2019. Continue negotiations with the city. If they cannot reach an agreement by December 31, 2017, then proceed with having the MCSO prepare to take over police functions in July 2019. The preference appears to be to have CMPD continue to provide police services to the unincorporated areas. This would allow current operations to continue uninterrupted. But if the county cannot get the city to change the formula, and reduce the cost, then the MCSO is the backup plan. Since the MCSO does not currently provide police services, they would have to create a new operational structure to meet the requirements.